I have been to 50 Plates in the Pearl a few times. I just love this place. 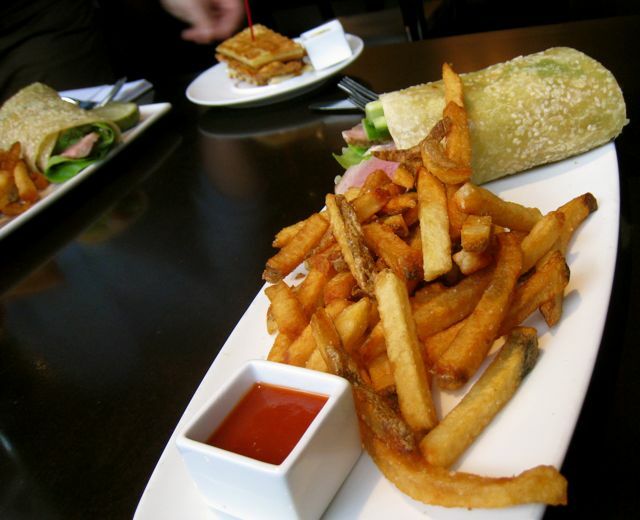 I personally think it’s best for lunch, as I really enjoy the lunch menu and pricing. I went down with an out of town guest. It’s a great place if you are trying impress someone. It’s very contemporary and in the summer the wall opens up to the street. This is my favorite item on the menu and I order it every time and share it with someone. It’s called the California Tuna Wrap. It’s pretty good sized, so we ordered one and split it, then we order Patrick Fries to share as well and then you can see on the side a Roscoe. Oh the Roscoe…Waffles, with crsipy fried chicken the middle, with coffee maple syrup drizzled across the top. But before you take that bite add a bit of the spicy mustard that is served on the side. OMG, I like this thing, but I have to say…it’s WAY to small. Nonetheless, this was enough to fill us up. The price was enough to make us giddy, as it only cost $16 for the 2 of us. Sad to say they took the Everything Sundae off the menu. Bad idea, that thing was great. I returned a few months later armed with my $50 Groupon and fed our family of 4 for lunch. I had to paid tip and just a little over. Great deal and another great meal. We made our way to 50 plates yet again. American Express had the support a small business Saturday, so we knew we could get $25 off. 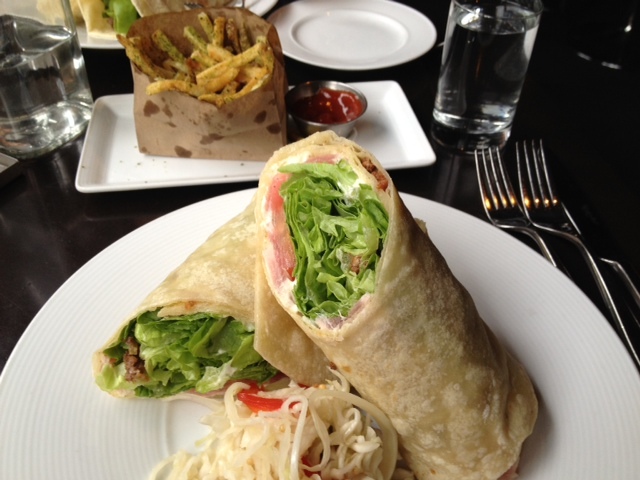 We saw 50 Plates on the list and we were craving the Tuna Wrap. We got down there and noticed the wrap was gone. When we asked about it they said they replaced it with the BLT&T. In the end it was basically the same thing except they added $7 to the price tag. It was good, but that was a bit of a bummer. We also got a side of fries that you can see are seasoned and also different from the last time we were there. Pricing is good for Lunch, great for Happy Hour, but expensive at Dinner. Not enough beers to choose from for me, but I manage to find something, just nothing special. What was the Everything sundae? It had chocolate chip cookies, hot fudge, chocolate chips, the list goes on of things in it. It was very good and not over the top. Now we will go to Paragon and get Chipwiches for dessert. They make these home made chocolate chip cookies and sandwich them around some ice cream then you dip them in hot fudge. We have been known to to do there just for dessert. I will add that to my list of places to write about. Dang it! Another trip to Paragon.